By 1979, we knew nearly everything we understand today about climate change—including how to stop it. Over the next decade, a handful of scientists, politicians, and strategists, led by two unlikely heroes, risked their careers in a desperate, escalating campaign to convince the world to act before it was too late. Losing Earth is their story, and ours. 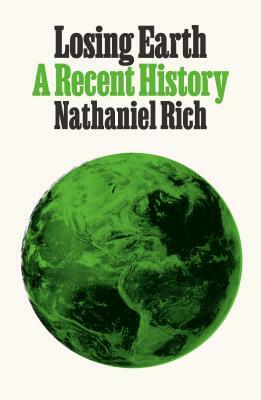 The New York Times Magazine devoted an entire issue to Nathaniel Rich’s groundbreaking chronicle of that decade, which became an instant journalistic phenomenon—the subject of news coverage, editorials, and conversations all over the world. In its emphasis on the lives of the people who grappled with the great existential threat of our age, it made vivid the moral dimensions of our shared plight. Now expanded into book form, Losing Earth tells the human story of climate change in even richer, more intimate terms. It reveals, in previously unreported detail, the birth of climate denialism and the genesis of the fossil fuel industry’s coordinated effort to thwart climate policy through misinformation propaganda and political influence. The book carries the story into the present day, wrestling with the long shadow of our past failures and asking crucial questions about how we make sense of our past, our future, and ourselves. Like John Hersey’s Hiroshima and Jonathan Schell’s The Fate of the Earth, Losing Earth is the rarest of achievements: a riveting work of dramatic history that articulates a moral framework for understanding how we got here, and how we must go forward. Nathaniel Rich is the author of the novels King Zeno, Odds Against Tomorrow, and The Mayor’s Tongue. He is a writer at large for The New York Times Magazine and a regular contributor to The Atlantic and The New York Review of Books. He lives in New Orleans. Get our Newsletter, Monthly Event Details, Newsletter-only Discounts, and news of the latest in print by Shelf Awareness.